If you cannot see this email correctly, please click here. As many of you have been following, the month of May has been a very productive time for World Sailing; especially with the World Sailing Mid-Year meeting having just taken place. While many decisions were made at this meeting, amongst the most impactful for the future of our sport was the selection of the 2024 Summer Olympic events. The decisions taken in this respect have not only empowered Sailing to be even more successful in the future but - for the first time in our history - we have decided to take a big step forward in maximizing the inclusion of women in our sport. This month’s newsletter will provide you all with insight into this overall selection process, the milestones of World Sailing thus far and future events. Just as every month, it is my great pleasure to share with you the “insights from the back office” and all the work we have done at World Sailing. The season is in full swing in the northern hemisphere and I would like to wish all of our sailors the best of luck and safe sailing. I myself will be racing a couple of events in the Dragon after a short break since the 2016 European Championships, but I am sure it is going to be a good time. I hope you enjoy reading this month’s newsletter and I wish good winds to all Sailors! 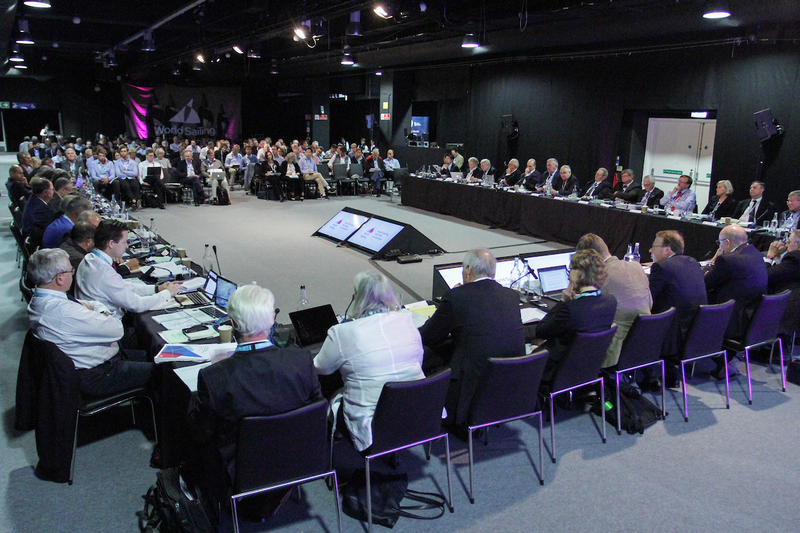 Following the World Sailing Mid-Year meeting which took place earlier this month, it is my pleasure to provide the sailing community with the results of Council’s decision regarding the selection for the 2024 Summer Olympic events and provide some context about the process. I am happy to report that the result was a success for the future of Sailing, as we decided for the first time in history to take a big step forward in maximizing the inclusion of women in our sport. On a personal note, I am happy with the result as I believe that this will make our sport more inclusive. Looking back, I have realized that over the years we as a sport have made little progress in improving gender balance. For many years we have wanted to showcase gender equality at the top of our sport, but this is difficult when it is not reflected throughout our sport. However, with the new selection of Olympic events I believe that this can lead to positive change for our sport and do more for the development of sailing then we possibly imagined. Change is upon us, I know that I have changed and I am happy to report that I am not alone; by focusing on full gender equity of athletes and in events (now having four mixed events going forward) we are sending a sign that gender is THE single most important measurement in our sport to grow, stay relevant and to attract youth. Therefore, it is my pleasure to report that the final two submissions for the 2024 Summer Olympic program support four mixed events and accommodate a broad range of physiques. Both submissions reflect how diverse our sport is, the first by including a new event for Offshore and the second including a new event for women - but both include mixed kite. In terms of the process, World Sailing came to these final submissions through a clear and transparent procedure in which we requested submissions from all our MNAs and Classes. We received many submissions, all of which were reviewed and evaluated by the Board and Events Committees – and the decision was narrowed down to a final few to be voted on by Council at the Mid-Year meeting. It was very encouraging to see the last three submissions clearly accommodated for the IOC Agenda 2020 in our sport going forward. In the coming weeks, we will have a meeting to outline the structure and framework required to build-up the new and existing events of the 2024 Summer Olympics in Paris, France. We will also be taking the clear direction of the Council regarding the inclusion of Offshore as a demonstration event for Paris 2024 - as we did for Tokyo 2020. World Sailing Strategy: For the first time in our history, World Sailing has an approved guiding strategic framework for its future direction, priorities and benchmark for success. The strategy is rooted in an extensive questionnaire sent to MNA’s from which their answers were compiled and a strategy formed. Paralympic reinstatement: The reinstatement of Para Sailing into the Paralympic program is the main priority for World Sailing. We have cleared the first threshold and are now focusing all our resources on ensuring the successful delivery of the World and European Para Sailing championships as well as finalizing a strong application. Promoting our sport: In close cooperation with our stakeholders, we are making great progress regarding the promotion and presentation of sailing through new media. With the strong support from Olympic Broadcasting Services and SAP Analytics, we have an excellent opportunity to showcase our major events and sailing at the Olympic Games in Tokyo like never before. World Sailing Sustainability Agenda 2030: World Sailing has now set out clear goals with regards to sustainability and is the first IF to get this plan audited. Already the IOC has been the first to recognize and endorse our program, and the next step is to pursue the endorsement of the UN as our program is aligned with 12 of the UN Sustainability Development Goals. e Sailing: World Sailing has now introduced eSailing and the launch of the eSailing World Championship. With this innovative display of our sport we hope to inspire existing and new sailors, but also use eSailing as a tool to attract youth. ASOIF Governance Audit: The new ASOIF governance audit placed World Sailing in the top seven out of 33 international federations. That aside World Sailing has started a Governance Commission to improve the way we operate. Our belief is that if we want to have the strong support from MNA’s then we must have transparency and right systems and processes in place. Event planning continues to be a challenge, with last minute changes and calendar clashes that can be upsetting not only for our sailors but also our stakeholders. While the fact remains that we only have 365 days a year and face varying seasonal challenges and continental struggles which host cities must to take into account, this is an issue that we need to address with all involved – classes, organizers, sponsors, etc – in order for us to make a positive change forward. One obvious consideration could be the alignment of combined multi-class events with class championships, which would deliver an attractive event for sailors and secure the interest of sponsors, media and broadcasters. Of course, further discussion and research is required but this can be a good starting point for us to consider as we look for ways to ensure our events and our athletes continue to strive.